Nor sure if this is the proper forum for this but I figured if anyone would know it would be you guys. Even as a definite Amateur I do have a lot of photos which I do not want to lose. . The short story is - I want to put my photos someplace on the internet so I can retrieve them if/when the media they are now snored on goes south. And I want to be able to access the photos so that I can link to them for websites that I can't upload directly like I can here. Originally I was sending my film to Seattle Film Works - they would do prints and a digital copy. This was long enough ago that it was the 3/14" floppies. At some point I got all the photos that I had on Filmworks onto CDs. But they are just a whole bunch of photos without any organization.Then Seattle Filmworks became Filmworks, and eventually went belly up and all the photos in their archive were moved to Shutterfly. This was sometime around 2007. The problem with Shutterfly was/is that I cannot easily rearrange the photos in the albums or the albums themselves, and I cannot seem to link to them as they are not stored as .jpeg files. It is also hard to download digitially - I have to do it one photo at a time. I have over 900 albums on Shutterfly.but most are smaller albums with 30-80 photos in them. Around 2008, I found Picasa which was a free program which would allow me to straighten out my photos - crooked photos is a big problem for me. So I have been uploading albums to the Picasa website. But as I am sure you know, Picasa is gone with the wind, and all the photos in Picasa are now on Google. I was OK with that. But recently, Google has made it impossible to make an album Public. I have tried every way I can think of, and I can't do it. Also the same problem with Google as with Shutterfly - the photos don't have a .jpeg extension and so I can't link to the photos, or at least not easily. I have 44 GB of photos on Google. I can sync those albums and I can download them. Before I went on this last trip (where I took another 1000 photos) I was downloading each album - they come zipped - and putting the zipped albums onto an external hard drive. So now I have photos on two different websites, and neither of them lets me do what I want to do with them. I've got maybe 200,000 photos on my computer or on an external hard drive- some good, a few excellent, some mediocre. The slide film photos have been digitized but not all of them have been organized. Do you know how I can make an album on Google Public? Is there a way to link to a photo in a Google photo archive? What other suggestions do you have? I have my photos on Picassa 3. 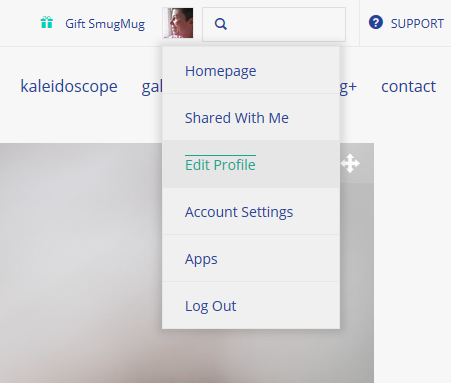 Let's review.. you're asking Smugmug to sponsor suggestions for you to post on a free web service? No I'm asking users of this website for suggestions of how I can get photos to an archive where I can link to them. I'm not asking Smugmug anything. If I can get to where I want to get by paying for Smugmug, I will do that. But only if it is easier than other options. The answer to both of those questions is** No**. I have been digitizing slides taken by my parents (in addition to the ones I took, plus some print photos) and there are over 10,000 that my parents took.. Indexing them has been slow - the catalogues of what the slides show is not digitized and is in many different places. I don't have a local D.A.M. as far as I know. I have, however, confirmed that I can't make an album on Google Public, and if I try, the URL of the album gives me a 404 bad URL error when I go to edit it. (I can do it, I just have to go in the back door). I've decided to just upload each section of slides as Limited Access because as irritating as Google is, it has the majority of the slides on it. And it is easier to get the photos back off of Google than it is to get them from Shutterfly. It doesn't sound like you're happy with your current solution. I know you've said that you would prefer not to pay for a solution but you may find that a Basic subscription to SmugMug would meet your needs better than Google Photos. You would be able to give access to full galleries to the public or you can limit access if you would like. You can easily download the photos if you need. You would need to upload all of your photos but I assume that since these are digitized images of slides that the file size is relatively small. The file sizes are as big as I can get them. The digitized slides are 2-4 MB. The slides date back to about 1943 for my dad's pictures, and back to 1958 for me, but of course when using film we tried harder not to 'waste' a photo since we had to pay for the film and the developing. I have catalogued about 7,000 of my dad's slides and about the same amount of my slides and prints. I also have the photos that I took digital to begin with - which I started in 2000 so 17 years worth. Those have gotten larger as time has gone on and the cameras have gotten better. Between 2002 and 2017 I've got between 2K and 10K a year - most years about 3,000. Uploading the photos would not be a problem as I do have time. Especially for the albums I have already edited. So how much storage would I have with a basic subscription? I'm not so sure about Shutterfly, so maybe someone else can weigh in. You can make Google Photo public. I remember there is a symbol of "share", you can click on that and choose "Publicity" or "Customized" to a specific group. That link takes me to something called Medium. Is that the same as SmugMug? Medium is a place for publishing articles. The article in that link was written and published by SmugMug and all of the links on that page point to items published by SmugMug. Hover over then click the icon representing you in the upper right of the screen while you are logged in. Select "Edit Profile"
Also see help page Update my profile information. I've done all that and read the Update my profile. But no matter what I do, the photo doesn't go from the thumbnail on the right be my name to the circle. 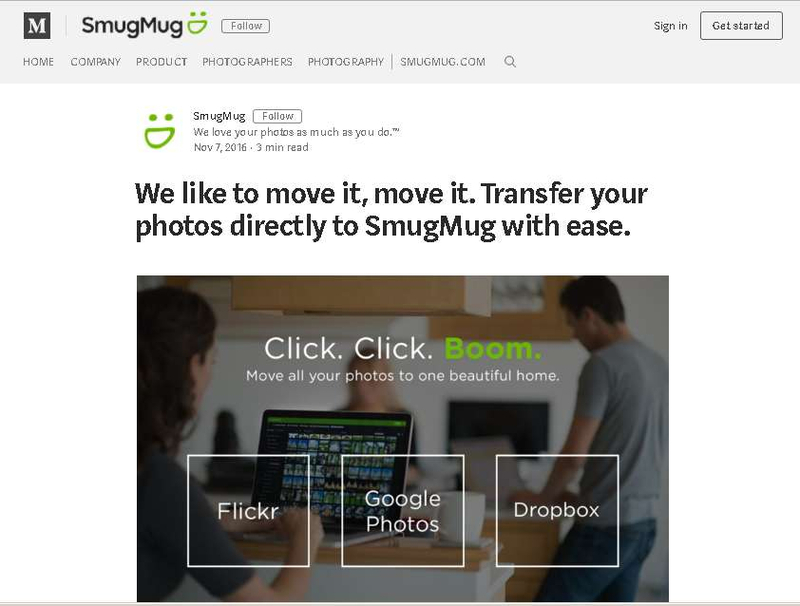 If you've already tried this and it doesn't work you might contact SmugMug support and have them take a look - http://help.smugmug.com/customer/portal/emails/new. Thank you for your help. I am muddling along. I can deal with folders, but I have a problem thinking of the word for the thing I put the photos in. (Gallery) I find that when I ask for photos from Google, that I do not get them neatly sorted into albums like I have them on my computer but in the order they were uploaded. But they transfer faster than if I upload from my computer. Also is there any way I can get rid of the blue hints - every time I access a Gallery, I get those which say what to do next. You can change the sort order for each gallery if you'd like. Go to Customize... Gallery Settings for the gallery you want to change. Click on the appearance tab and change the Sort By and Sort Direction as desired. The blue hints will go away - I think once you have scrolled through all of them. 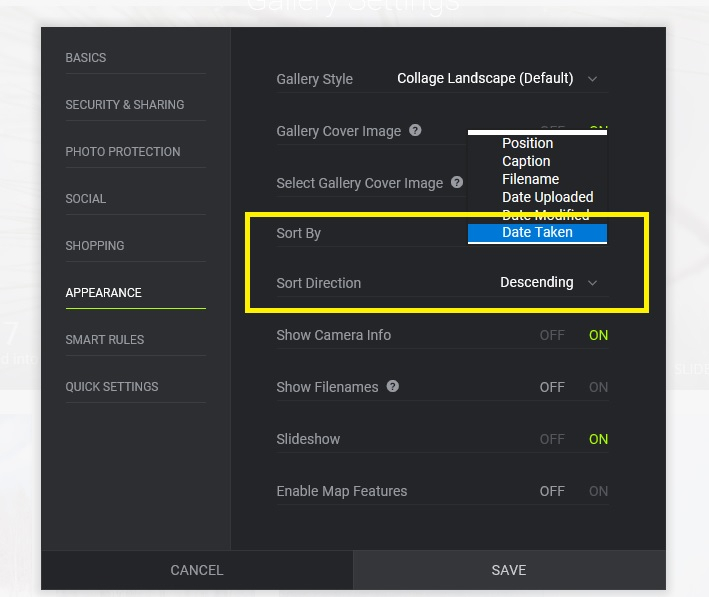 If the photos moved over from Google are not organized into galleries as you wish, you can move photos to different galleries in the organizer. Go to the help page http://help.smugmug.com/customer/portal/articles/1213254?b_id=14503 and scroll down to the section titled Arrange/move photos. There is a short video in that section that shows how to move photos. I don't know how to turn them off other than clicking through all of the hints. It might be worth contacting the helpdesk to see if they have any way to turn them off. The Helper turned them off for me. I have just tried to upload a gallery of 300 photos I took at the Veterans Day parade last month. It has taken hours. It is quicker from the Google albums, but once I get past the first few hundred photos, it's hard to get the photos picked reliably. So I'm thinking of uploading each one to Google first. But that's going to be confusing. I have just tried to upload a gallery of 300 photos I took at the Veterans Day parade last month. It has taken hours. It's probably worth contacting the help desk with this. Delays like this are often because of the speed of your Internet connection but given that you are seeing a difference between uploading to Google and to SmugMug there may be something that the help desk can suggest to improve this.